I'll let you research the definitions to these terms! The words äccuracy" and "precision" are often (incorrectly) interchanged with one another. They have distinct and separate meanings, though. Regarding the word "traceability," you might want to elaborate on electrical metrology as a career in itself. Maintaining international measurement standards is a work-intensive endeavor, and qualified electronics people at all levels of expertise (technicians, engineers, researchers, scientists) are needed in many locations around the world to maintain the system. Though it may sound boring, metrology is essential to state-of-the art scientific research as well as modern industry. In chemistry laboratories, balance scales are used to precisely measure the mass of various substances. How, exactly, is a laboratory "balance" scale used? What component of the scale primarily determines its accuracy? 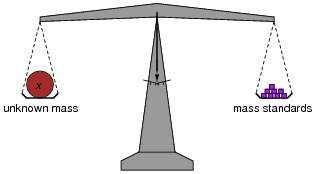 A "balance" scale works on the principle of masses in equilibrium: the unknown mass is countered with known quantities of mass until the scale registers a condition of balance. The circle with the letter "G" in it is a symbol for a galvanometer. What practical purpose might a system like this serve? The first question your students are likely to ask is, "What is a galvanometer?" Let them do the research on this question! The answer is easy to find. What is the minimum number of points along the meter's range that it needs to be calibrated at, given the assumption of perfectly linear response? Ask your students if the two calibration points on the meter's range should be close together, or far apart, for the best (most comprehensive) calibration possible. Discuss the easier calibration requirements of the differential meter. Challenge your students with this question: "Does the measurement linearity of a voltmeter matter as much if it is used to make a differential measurement, as compared to if it is used to make a direct measurement?" Why or why not? Short the voltmeter's test leads together. This creates an input condition of zero volts. Challenge your students with this question: Ïf zero is an appropriate signal to use for a single-point calibration, then why not just leave the two test leads disconnected? Why should you short them together?" If you happen to have a sensitive voltmeter available in the classroom, the answer may be demonstrated with ease. This is especially true if you place the voltmeter in the ÄC millivolt" range so it picks up stray power-line voltages from nearby electrical devices and utilities. However, if you perform this same experiment using a real voltmeter, the measurement obtained with the meter will be substantially different from what should be there, based on a prediction of 1/2Ebattery. Explain why the voltmeter registers as it does. What is it about this circuit that causes the measurement to be so far off from the prediction, when we know full well that other voltage divider circuits we've constructed do not exhibit any significant error? This circuit is a demonstration of voltmeter "loading" on the circuit, by causing a falsely low measurement. Meter "loading" is a serious problem in electrical metrology. It is a basic principle of measurement that a measuring instrument always impacts the quantity being measured, to some extent. In cases like this, the extent of impact is severe. For those instructors with some background in quantum physics, please refrain from perpetuating the myth that meter loading is an example of Heisenberg's Uncertainty Principle. The Uncertainty Principle has nothing to do with the impact of a measuring instrument on something we measure. Rather it describes an uncertainty inherent to the quantity itself. If you want to share a true electrical example of this uncertainty principle with your students, wait until they study harmonics and spectrum analyzers, where you can tell them it is impossible to measure both the instantaneous amplitude of a signal and the frequency of a signal with unlimited certainty. Move the switch to the "Bal" position and adjust the potentiometer until the meter movement registers zero volts precisely. Then, move the switch to the "Meas" position and read the voltage directly from the meter movement. "Potentiometric" DC voltage measurements used to be commonplace in industry prior to the advent of precision electronic voltmeters with high-resistance inputs. The technique, though, is certainly not obsolete, and in fact is still employed in metrological laboratories worldwide to obtain the most accurate (no-load) voltage measurements possible. An ärtifact" is a non-reproduceable object that is arbitrarily deemed the ßtandard." An ïntrinsic" standard, by comparison, is a reproduceable standard based on immutable physical constants. A great example of an ärtifact" standard is the metal bar which used to be the international standard for the "meter" (metric unit of length). Ask your students how convenient it would be for scientists working around the world to calibrate their equipment if the only primary standard for length measurement were a single bar of metal. What benefits may be derived from the use of ïntrinsic" standards? An excellent example of an easily-accessed intrinsic standard is the standard for time, available via shortwave radio: 5 kHz, 10kHz, 15 kHz, and 20 kHz (there are other frequencies, too). Have any of your students heard of timepieces that synchronize themselves to an ätomic clock"? With a shortwave radio, they can tune into that same atomic clock's broadcast and synchronize their own wristwatches! This is an excellent discussion activity, and a great way to garner student interest in what is potentially a dull subject. Calibration laboratories often make reference to Test Uncertainty Ratios (TUR's), normally holding to a ratio of 4:1 or more when performing calibration work on instruments. What does this figure mean? The "Test Uncertainty Ratio" refers to how much more precise the calibrating instrument is compared to the instrument being calibrated. While your students may never have to calculate TUR's, it is still important for them to know what the general principle is. If any of them experience difficulty understanding the concept, ask them if it makes any sense to use a ruler to check the calibration of a micrometer, or to use a wristwatch to check the long-term stability of a laboratory-grade chronograph.